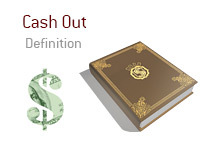 What does the term "cash out" mean in the world of poker? What is the definition of the term "cash out"? In poker, the term "cash out" refers to when a player leaves a cash game and cashes in their chips. For instance - let's say that you are playing in a $5/$10 No Limit Hold'em game at your local casino. You buy-in for $1,000. After four hours of play, you have a stack of roughly $4,700 in front of you. You didn't have to rebuy once. You have plans for the night, so you decide that you are going to "cash out" and head home. You rack up and head over to the cashier, where you trade your $4,700 in chips for $4,700 in cash. This is "cashing out", as you are exchanging your chips for cash and are leaving the game.